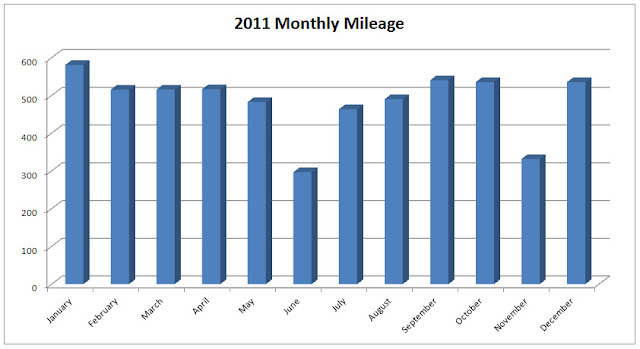 First, some data, starting with running - I ran 5806 miles this year (average of 112 miles per week). That is at least 2000 more than I have ever done previously. 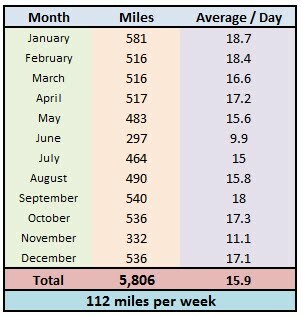 I wish I had more complete training logs from prior years, but I am 100% certain that I never ran more than 3500 miles in a year before. So this year was a huge leap forward in terms of consistency and health. Obviously the payoffs were huge, as I ran PRs in every distance from 5K to the marathon (more on that shortly). To keep my upper body from getting too scrawny, I did a pretty good job on perfect pushups this year. My final pushup total was 26,500. About 90% of those were perfect pushups, the other 10% was regular pushups (when I was traveling and didn't have access to my shred-handles). While I didn't put in 100+ days of skiing like I did during the 2009-2010 winter in Vail, we still did a ton of high-quality skiing. The final tally was 60 ski days (48 human-powered, 12 lift-served) and were did a little over 160,000 feet of vertical climbing on those human powered days. The quality of the turns we earned was almost unreal - we only skied a handful of days in marginal conditions - almost every day was either light powder (winter) or creamy corn (spring/summer). The Wasatch range received over 750 inches of snow during our first winter skiing here! On a resource conservation note, I only drove my car to work 98 days this year. The majority of days I ran back and forth from home, thus saving valuable time and gas money. Now, some personal highlights, starting again with running - this was quite a freaking year! I didn't expect to accomplish even a fraction of what I did, but as the year went on I just kept setting my sights higher and higher, and ended up having the best year of running of my life! In total, I ran 17 races (full list) and notched personal bests in every distance from 5K (15:04) to the marathon (2:21:47, which was my debut at the distance). A pair of half-marathons (1:05:40 at Top of Utah and 1:05:45 at Long Beach) were probably my best performances of the year. 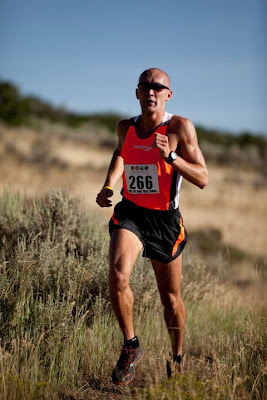 Halfway through 2011, Andrea and I started running for Saucony, which has been an awesome relationship to date. We love the company and representing them out on the roads and in the running community. This year has been the most FUN I have ever had running as well, which is a big contributing factor to the success I've had. Joining the Fast Running Blog was one of the best things we did all year - I not only learned a lot from some of the other great runners on the blog, but made some new friends, gained new training partners, and now have an unbelievable support system. The focus for the fall was the Philadelphia Marathon, where I attempted to qualify for the Olympic Trials. Needless to say, that race ended up being a bit of a disaster and huge disappointment (I was on 2:18 pace through 21 miles, then blew up and finished in 2:25:57). But character is often defined by how you bounce back from adversity. This quote pretty much sums up how I feel about that experience - "If you don't fail at something at least once, you haven't set your goals high enough." If I've learned anything about myself as a runner this year, its that 1:05 / 2:21 is far, far below what I am capable of. My ceiling is a lot higher than I ever thought, and over the next couple years (starting in 2012) I'm going to dream big and run a lot faster than anyone (including me) ever imagined I could. Enough about running - lets get back to more highlights... trips and skiing!!! This is our backyard! How can you beat living in Salt Lake City? My sister skiing the deepest powder she had ever experienced at Solitude! Meadow Chutes / Silver Fork - the deepest day of the season? Mt Superior - A rite of passage! Of the trips we made this year, there's no doubt that our summer vacation to Lake Tahoe and the Sierras comes out on top! I absolutely love the Sierra Nevada range, and Tahoe is a great place as well. Its hard to even want to plan trips to other places because there is so much I still want to do in those areas! We also made a few trips to southern Utah - I thought Snow Canyon was an especially cool park, and Arches is also a fun place to visit. A fishing trip to the Uinta mountains with my Dad and uncles also definitely gets a spot on the best of 2011 list! The best purchase of the year was definitely our mountain bikes (because technically the BEST PURCHASE EVER - Dynafit bindings - was done in late 2010) - the bikes ended up being a lot of fun and we're looking forward to using them even more next year. I would have to say that my favorite rides of the year were both in California - the trails at Tahoe XC and the Inyo Craters Loop in Mammoth Lakes. I also enjoyed the challenge of riding Park City's mid-mountain trail after doing a long run at Jeremy Ranch - that was a tiring day! Considering that everything I listed above is only a fraction of everything we did in 2011, it doesn't seem possible, but I still managed to get promoted at work! The High Sierras - One of my favorite places in the whole wide world! ... Andrea also likes ice cream! very realistic to shoot for 2016! The one time we dressed up this year!!! So fun to read both of your recaps. You both live life to the fullest and I love that about you. 2012 will be a great year for you. Thank you for sharing your journeys and being a huge inspiration to so many that look up to you. Man, you had quite the year. Your mileage and consistency are amazing, and your results were a reflection. I just can't believe you did a summary of your year without mentioning Mtn. Dew! Fantastic report. It's amazing to think that you fit all that in. Crazy. When you are ready to do that 'epic' trail run, let me know, I've got some ideas that you'll love. I really should have written something about mountain dew - quitting for 2 months might have been the most impressive thing i did all year! Craig - if the planets align this year, and I know off some of my racing goals, I'd love to organize a group for a R2R2R... or something up in the Wind Rivers or Tetons... or anything like that really!